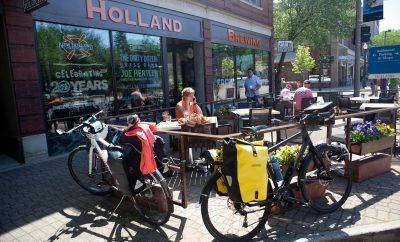 Beaver Island is another location that I like to go for a relaxed weekend bike touring in Michigan. While the roads there are mostly dirt and gravel, and not always the smoothest, the low traffic, the natural surroundings and occasional scenic views make the island a great bike touring destination. 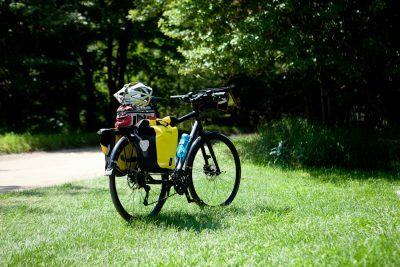 Since the island is fairly small (even though it is the biggest Lake Michigan island), you can squeeze maybe about two days of up to 50-mile rides, without much of going twice on some roads. The most roads, with the exception of King’s Highway, are dirt and gravel. Most are fairly smooth. Only in the southern part of the island, I did encounter some washboards and rougher sections. There are very few hills. 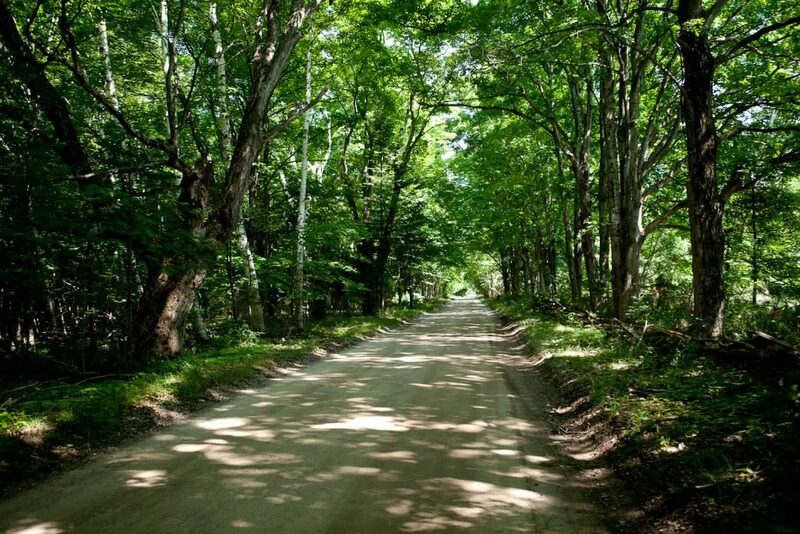 Many roads go through wooded areas, so there is enough shade to keep you cool even in the middle of the hot day. One of the nicely shaded roads on the island that I rode on. Beaver Island is an inhabited island located in the northern part of Lake Michigan. The island is 13 miles (21 km) long and 3 to 6 miles (5 to 10 km) wide. Even though the ferry to the island goes from Charlevoix, the island is closer to the Upper Peninsula. The island population ranges from 350 to 700 depending on the season and is concentrated mostly in the area of St. James, the only town on the island. There is only one way of getting to the island with a bicycle – by a ferry. 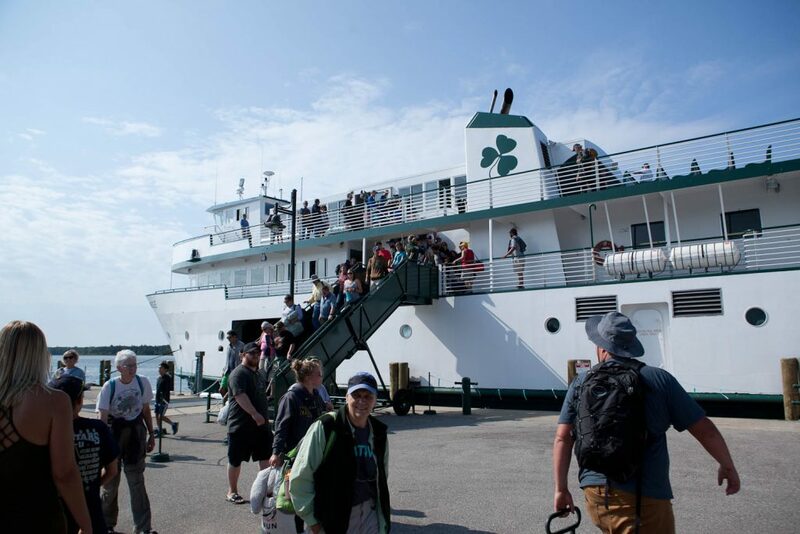 The ferry service is offered by the Beaver Island Boat Company. Two boats go back and forth between the Charlevoix and St. James on the island. Beginning the week before Memorial Day till week past Labor Day the ferry service is offered daily. On some weekend days, there are four departure times. You can check the ferry schedule here. The rates are not the cheapest. It cost $65.00 for a person and $24.00 for a bicycle for a round trip. The whole trip takes a little over two hours. However, you cannot make a reservation. Passengers space is offered on a first come, first served basis, so you need to be at the dock earlier. I don’t know if they ever run out of room and turn some people away. 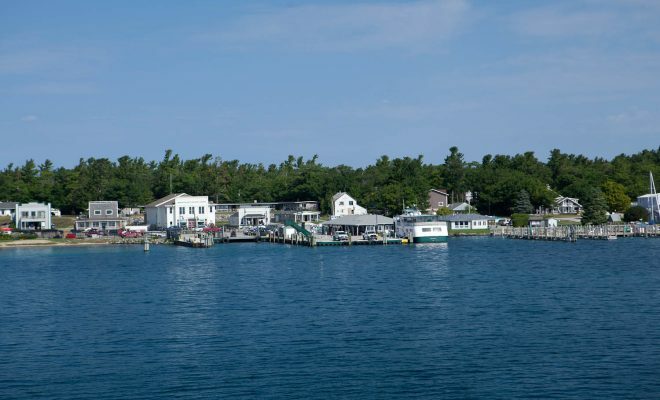 However, Beaver Island is a popular tourist destination in the summer. When I went, in the early August the boat was about 90% full. 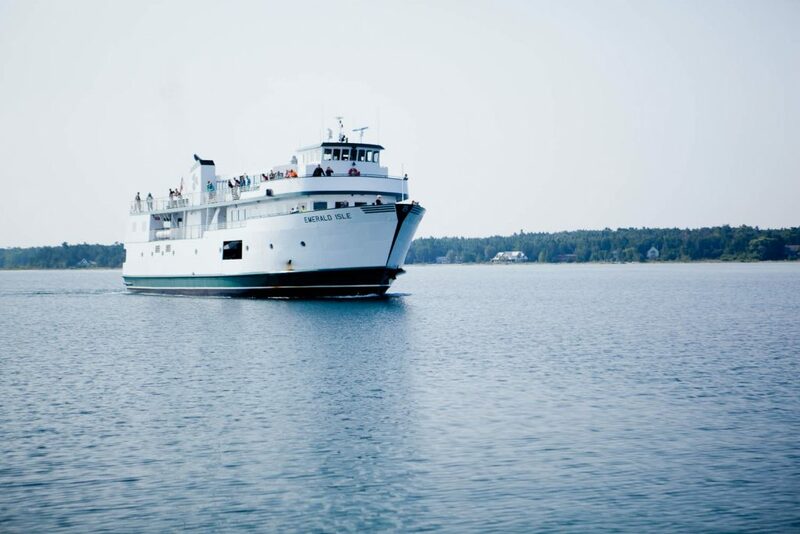 I noticed that many people come for a day only, taking the 8:30AM ferry to the island and then 5:30PM back to Charlevoix. Again, if I plan to go, I suggest, you read the BIBCO Frequently Asked Question section here. Passenger getting off the ferry at the dock in St. James, Beaver Island. The ferry docks in town, and the most of any facilities are located there or in the vicinity. 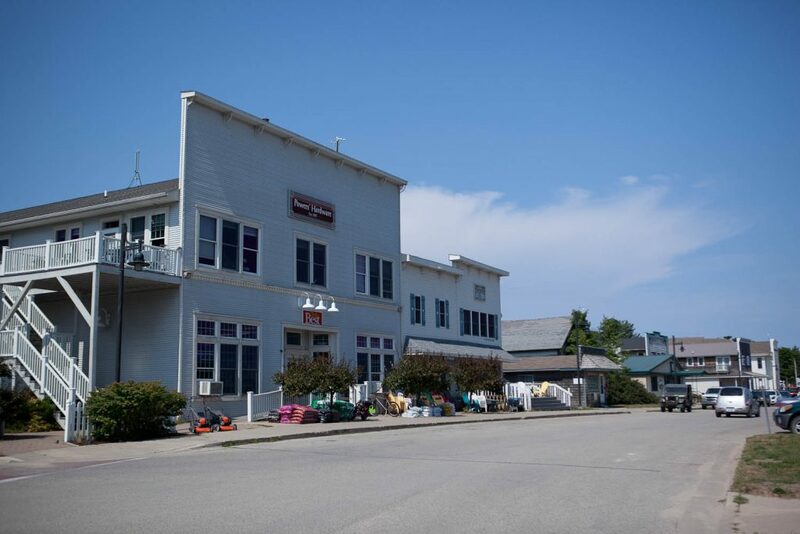 There are few hotels, motels in town and a municipal, St. James Campground nearby. Most restaurants are in town or close. There are few stores with food and beverages. 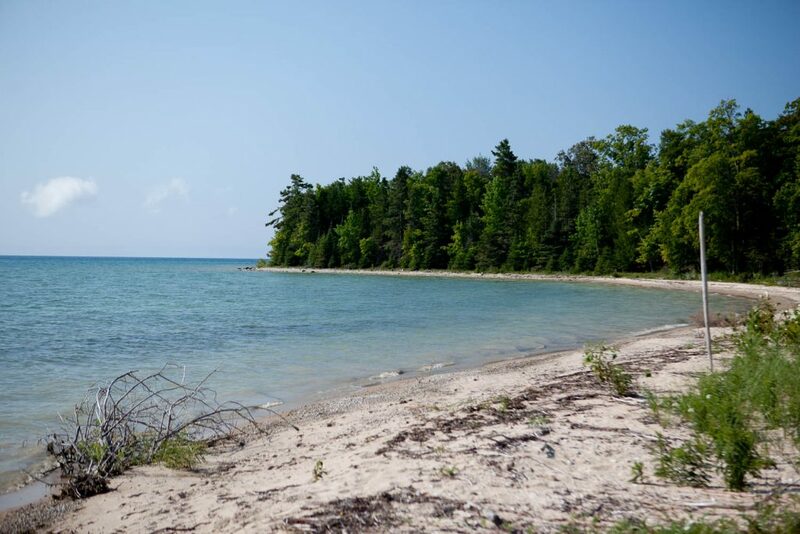 There are two more campgrounds on the island – Bill Wagner Campground, midway along the eastern shoreline and Beaver Island Hideaway Campground, located a little west of the center of the island. On my trip, I took the 8:30AM ferry to the island, to get there early enough, so I could still do some amount of riding. We arrived at St. James dock shortly after 10:30AM. It takes a little time to disembark, since they first unload the cars and cargo. 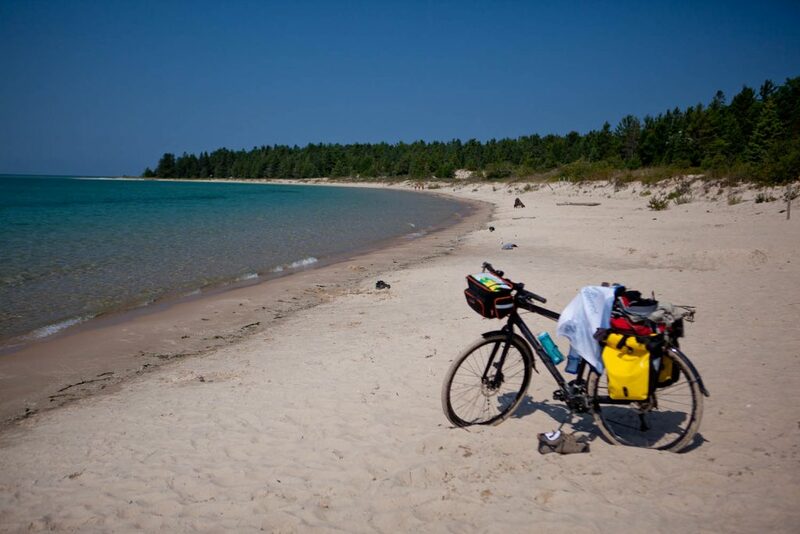 But around 11AM, I had my bike loaded and was on the way to St. James County campground, where I planned to camp. The campground is located about a mile west out of town. I like to camp when I am touring and the weather is nice. It keeps me more in-tune with nature. Anyway, the St James County campground is a primitive one with outhouses and water pump. 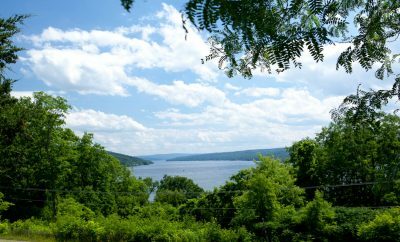 It has a great location on a bluff overlooking the lake. 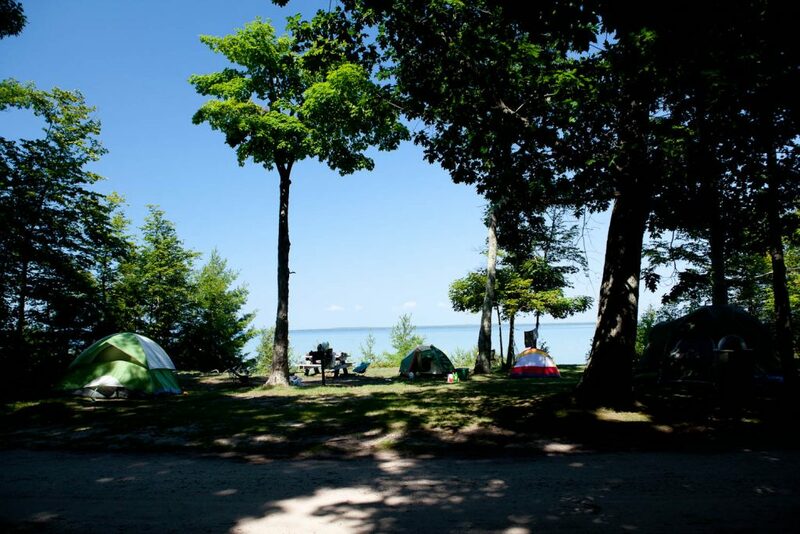 There are only 12 grass and tree covered campsites. The paved bike trail leads to it from St. James. The trail begins at the corner of King’s Highway and Forest Ave. It took only few minutes and I was there. Unfortunately, all the campsites along the bluff were already occupied. I had to settle for a one across the road. Still pretty nice – grassy and shaded. Just no direct view of the lake. I quickly setup my tent and threw my sleeping pad and bag inside. Changed my clothes for riding and got on the bike heading out of the campground west on Donegal Bay Rd. Soon I turned north on Front Lake Rd. Then I just road along many of the small roads in the northwest part of the island. Since my Wojan-Cashman map (which you can buy on the island, or order ahead from the Chamber of Commerce) did not show many of them, or did not show the names, I just rode along and paid more attention to direction in choosing my route. After riding for about hour and half, I got hungry, since I did not eat anything since early morning breakfast. So, I went back to town and stopped at Daddy Franks on Forest Ave. The place has outside tables, which I prefer in nice weather. The place was fairly busy, but the wait wasn’t long. Stop for lunch at Daddy Franks. After lunch, I continued to ride around the northern part of the island. I rode south on King’s Highway. Passed the Welke Airport – one of the island two airports. And continued south all the way to Paid Een Ogs Road. (Strange name is the name of an Irish immigrant that lived on the island. If you would like to read more about Irish influence, there is an interesting article here.) Then I took the Paid Een Ogs Road west all the way to Donnel Mor’s Lane, which I took north, passing by the other airport on the island. By the way, if you want to get something to eat or drink, while on the way, there is a place, Paradise Bay Coffee Shop, right across the road from the airport. I continued north all the way to Sloptown Road, which I took left (west). I wanted to go to see Protar’s House and Protar’s Tomb. 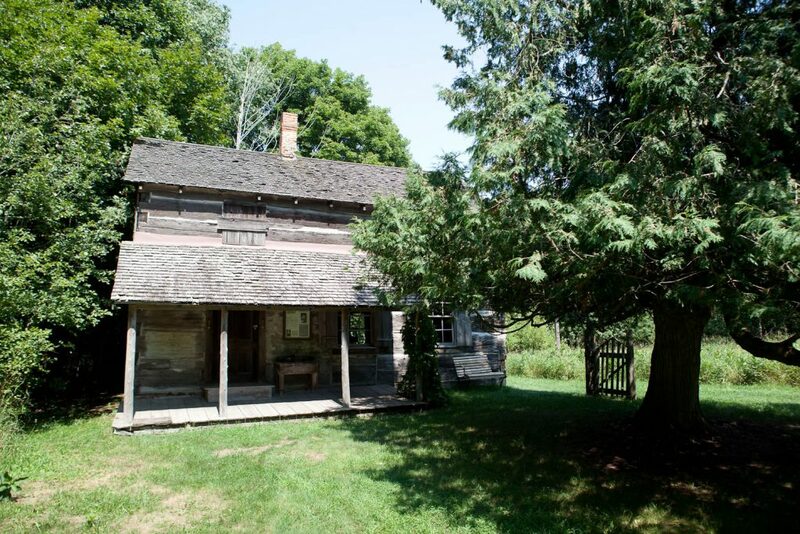 (I’m surprised that Protar’s House is not showing up on Google Map, since it is a historic landmark.) Since, you cannot find it on the map, here is the location. 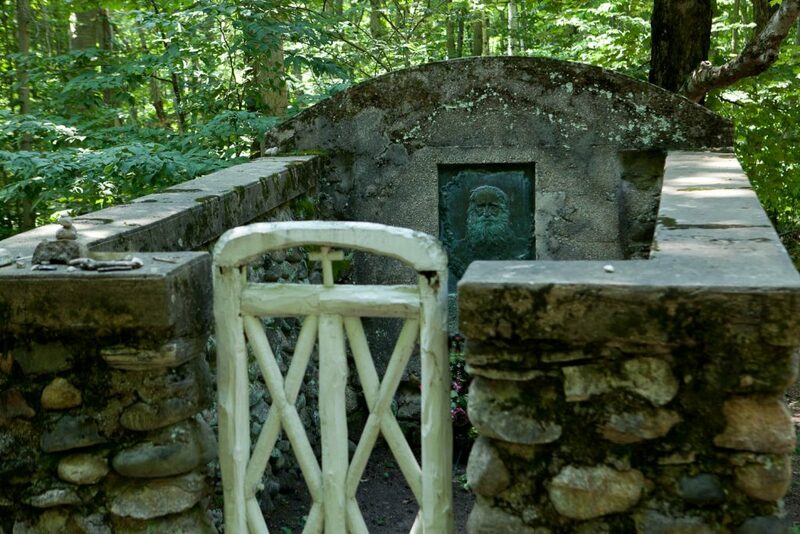 It is on the north side of Sloptown Rd, less than half way between Donnel Mor’s Lane and Protar’s Tomb Rd. After visiting the landmarks, I rode further west on Sloptown Rd to check out the Bonners Landing. There is a trail there leading to the beach. The place was empty. It is amazing in how many places here you can have the beach all to yourself. This is why I like the locations like Beaver Island. Anyway, from there I went back east along the Sloptown Rd all the way to King’s Highway, which I followed back to town. It was still pretty early, so I went north along the shoreline to explore the peninsula. There are few places that might be worth stopping, depending on your interests. 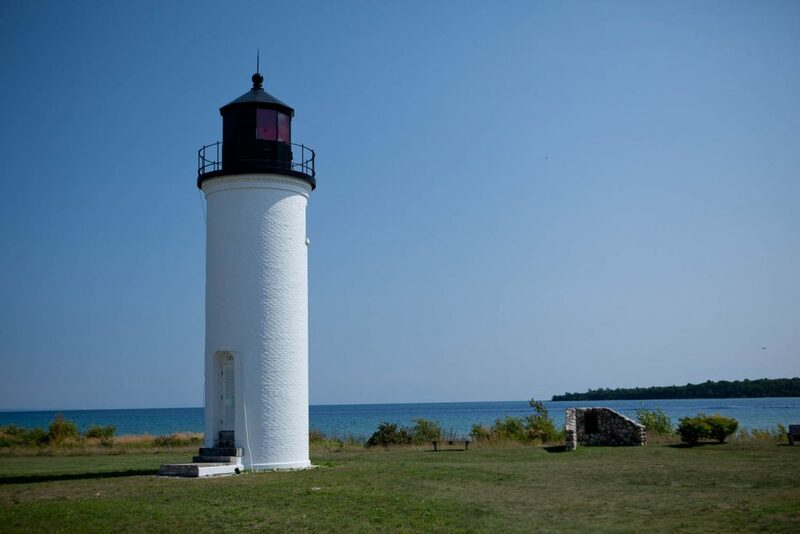 There is a small Marine Museum, Beaver Island Toy Museum, and at the end of the road, Beaver Island Harbor Light. The lighthouse is not that impressive. However, if you, like me, want to take pictures of as many Great Lakes lighthouses as possible, you will stop to check it out. 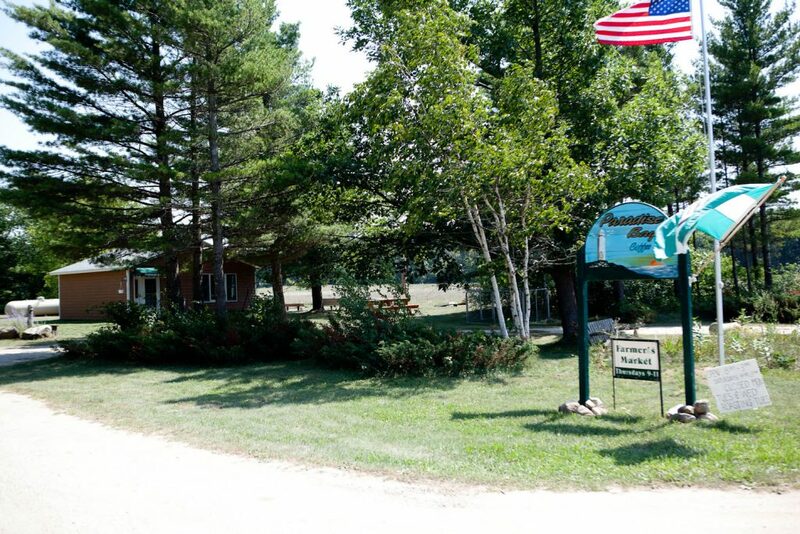 On the way back, I stopped at the grocery store, McDonough’s Market, on Michigan Ave, east of Freesoil Rd, and bought some cold beverage and went back to the campground. Later in the evening I rode to get dinner. 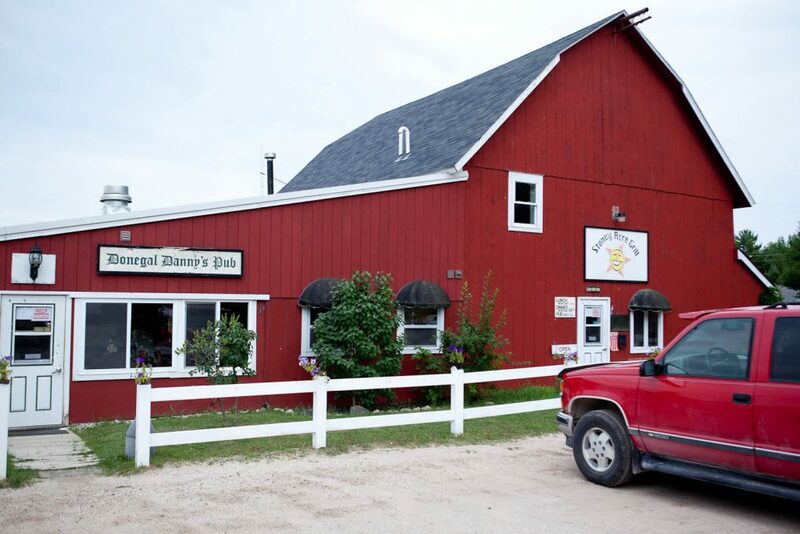 I went south on King’s Highway to Beaver Harbor Dr. Just short distance east there are Stoney Acre Grill & Pub and Donegal Danny’s Pub. They are right next to each other and I think the same establishment. I had a perch basket there. Even though, I am not a fan of deep-fried food, fish was good. After dinner, I rode around town for a bit and then went back to the campground. The total for the day was just above 40 miles. Not an impressive distance, but I came here to explore and relax, and not to ride a century. I did not get much sleep last night, so I went to bad early. Next morning after breakfast at Harbour Market on Main Street, I began the longer rider along the southern part of the island. I went south on King’s Highway till the intersection with East Side Drive. Right at the corner, there is Beaver Island cemetery. The church that now stands in St. James, was originally located somewhere here too, till it was moved in 1957. 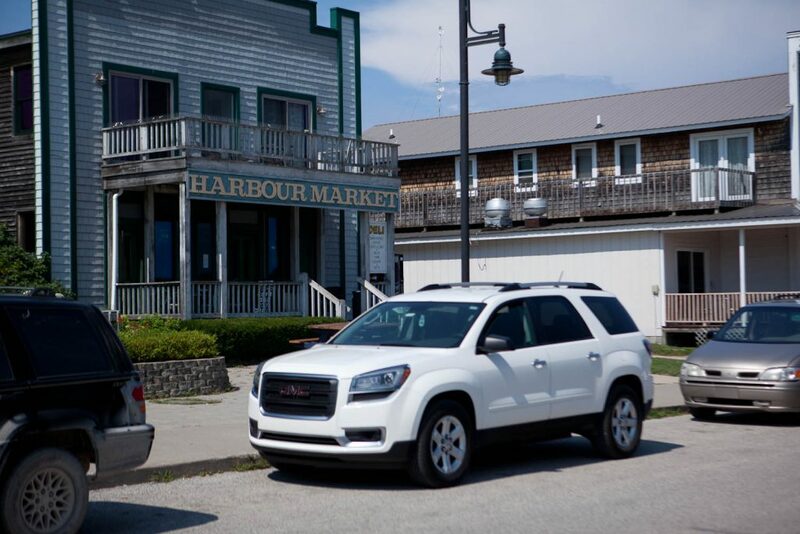 Harbour Market in St. James. 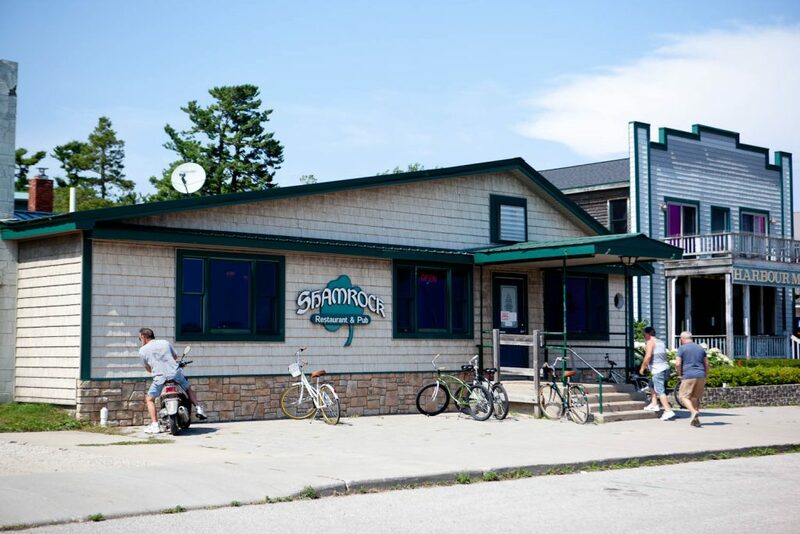 Right next to the cemetery is another restaurant – Circle M. There is no other place to eat further south. I took the East Side Dr east and then south, soon passing by the east side of Welke Airport. The road went southeast before it turned dead south. At first it went through open fields, but soon it was surrounded by woods providing a decent shade along the way. I continued south, and in few miles passed by CMU Biological Station. The road was pretty wide, and there were occasional cars passing in both directions. The traffic was not heavy by any means. However, I would have not expected to see vehicles as often as I did, considering low population of the island, and high ferry fare to bring the vehicle here. I stopped at Martin’s Bluff and hiked a short trail to the beach. Secluded beach somewhere south of Martin’s Bluff. After riding for another few miles, I stopped again. There was no sign that it was a public beach access, but there was also no “no trespassing” sign. The beach was nice there, even though it was narrow. It was completely deserted. After a while of relaxing at the beach, I continued south and stopped next at the Lake Geneserath. There is a public access road on the northeast side. There was nobody there. Only one truck was parked, and I saw one fishing boat with people at the distance. 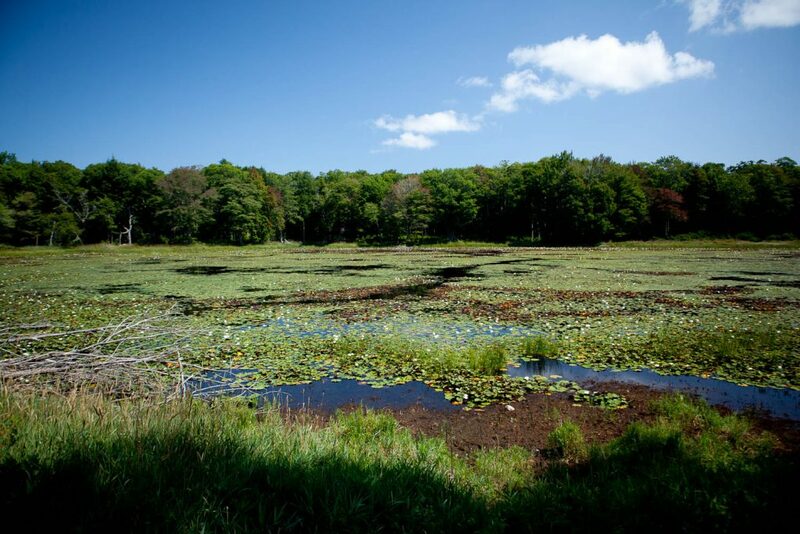 The lake shore was overgrown with aquatic vegetation, like all other lakes on the island, and not suitable for a swim. 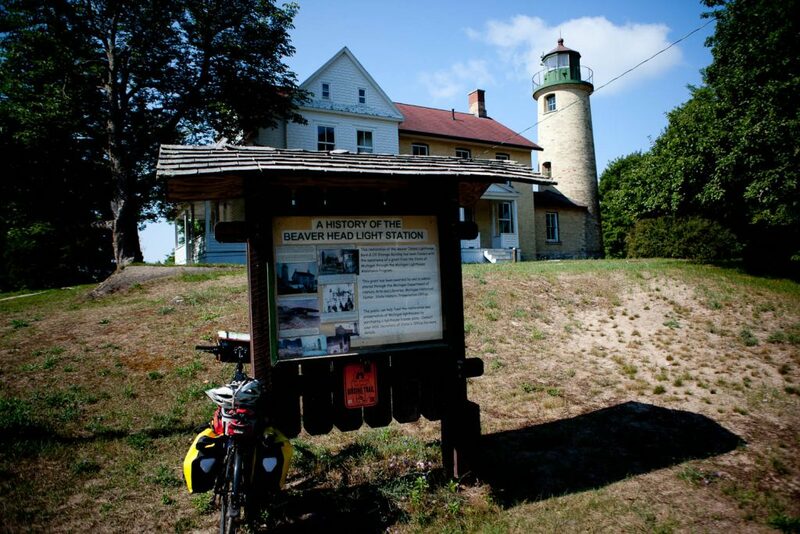 I continued south and after reaching the south end of the island – west, and soon reached the Beaver Island Head Light, the second lighthouse on the island. The lighthouse, like the Harbor Light, is not very impressive. (See the picture.) However, had to check it out. After a short break at the lighthouse, I rode further west, and soon stopped at the public beach. This one was quite nice, wide, and stretching for a long distance in both directions. There was nobody there. Beach at the southern tip of the island. Since it was hot and humid, even though I was riding mostly in some shade, I was sweaty. So, I decided to take a break and go for a swim. After changing to my swim gear, I jumped in the water, which at the moment appeared to be quite cold. It was only because I was warm. After cooling off in a shallow water at the shoreline, I finally gradually went in for a swim. Now, the water felt warm. I was in it for a good half-hour, when a bigger group of people arrived in two minivans, ending my deserted island day-dream. 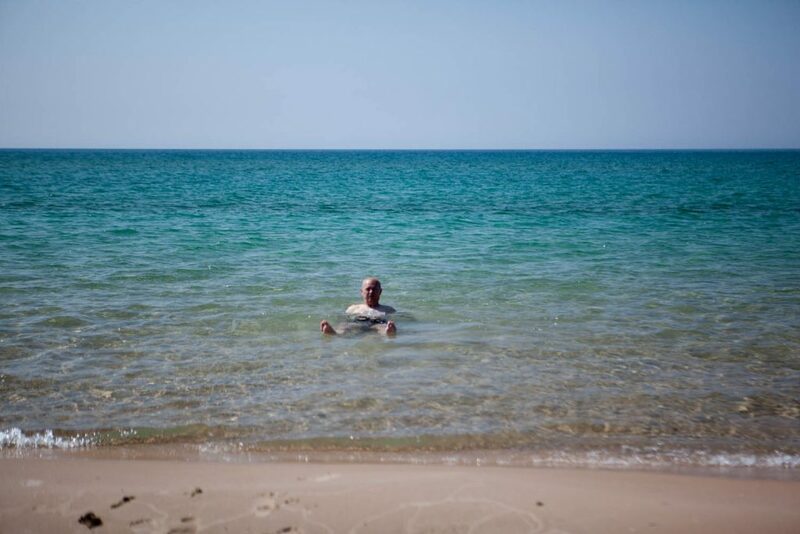 Cooling off in Lake Michigan. Anyway, it was time to get on the bike again. The road section from the beach west was at times heavily covered by send, and riding was more difficult. However, even with my smooth 37mm road riding tires I was able to get through. Soon the road veered off the shore into the woods and turned into West Side Drive. Here is a section with only steeper hills that I encountered on the island. The road here was also narrower and also not as smooth. It soon widened and improved. I continued on the West Side Dr till I got to Miller’s Marsh, were I stopped to check it out. Somewhere around here West Side Dr turns into West Side Road. I continued north on it and made a next stop in a couple of miles, at Greenes Lake. Like all the other, it was, to some degree, overgrown with aquatic vegetation. 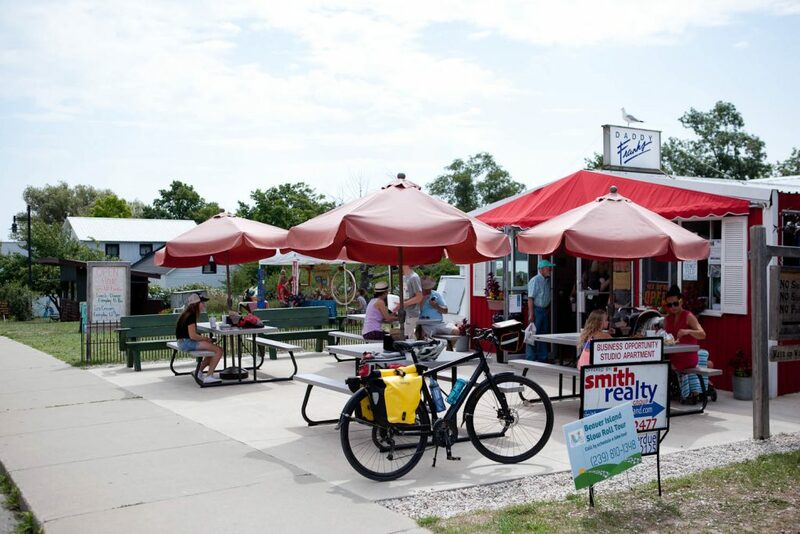 I kept riding north and made a next stop at the Beaver Island Hideaway Campground. 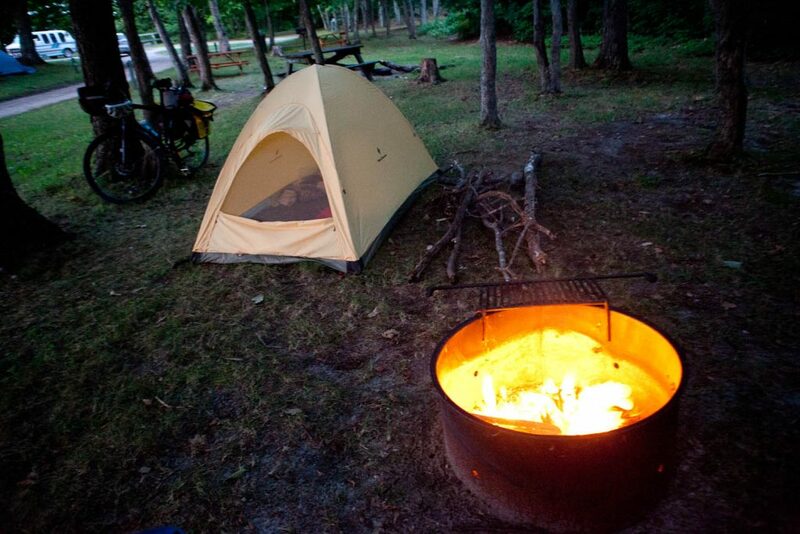 It is a primitive campground located deep in the woods. It has pit toilets, sand volleyball court and disc golf area. I did not spot a single tent there. It was completely deserted. The road leading to the campground has some big potholes, and some low spots with mud. I went back to West Side Rd and continued on my way north. At the intersection with MRS Reddings Trail, the road veers to the right (east). In about a mile it ends at the intersection with Fox Lake Rd, Paid Een Ogs Rd and Donnel Mor’s Lane. From the intersection, I took Donnel Mor’s Ln north passing again by the Beaver Island Airport. I stopped at the Paradise Bay Coffee Shop, on the opposite side of the road from the airport, for lunch. After having a white fish sandwich, some ice tea and a nice conversation with the owners, I got back on the road. I kept going north till Sloptown Rd, which I took east (right). I took Sloptown Rd all the way to King’s Highway, and then King’s Highway north (left) all the way to St. James. In town, I rode to grocery store, and then back to campground. In the evening, I went for dinner to Shamrock Bar & Restaurant, right in town, on Main Street. After dinner I rode around town a bit, and then headed back to the campground. Since, I caught up on my sleep, I could have a bonfire tonight. It was early August, and it would not start getting dark till about 9:30PM. Therefore, I read a book till about 9:15, when I began a fire. After few hours by the bonfire and a good quantity of wine, I went to bed. The total mileage for the day was just under 50 miles. That included all the riding, the loop around the island, the trips to town and dinner. It was the time to leave the island. 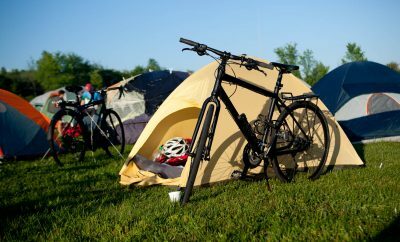 When I got up, I began packing and around 9:00AM left the campground and went to town. For breakfast, I went again to Harbour Market. I liked having the breakfast on their porch. After eating, I sat there for a while and chatted with the owner, who came out to catch a break between customer waves. We talked for a while about the life on the island. Later I left and rode for a while around town, which does not add to much. I was planning to take an 11:20AM ferry to Charlevoix. So around 10:00 I took my bike to the ferry parking lot, and still left the ferry dock and walked along the Main St. The ferry came in at 11:00, and by 11:20 we were on our way back to the mainland. Ferry approaching the dock in St. James. Another short trip came to an end. Beaver Island is not a place to get a lot of miles. I guess, you could, if you repeated some roads. Riding on the dirt and gravel roads makes it a little more difficult than on the hard pavement, so you still get a workout. If you like nature and solitude, you will like riding there. The weather was nice. Even though it was hotter than the average temperature at around 85F and higher humidity. Nights were nice and warm, but not hot. There were very few bugs. I think that over my 2 and ½ day stay, I’ve seen less than 5 mosquitoes. Of course, in the woods there were flies, and wasps, and other flying bugs here and there. But not the biting kinds. ← Previous Story What the Heck are Pasties?